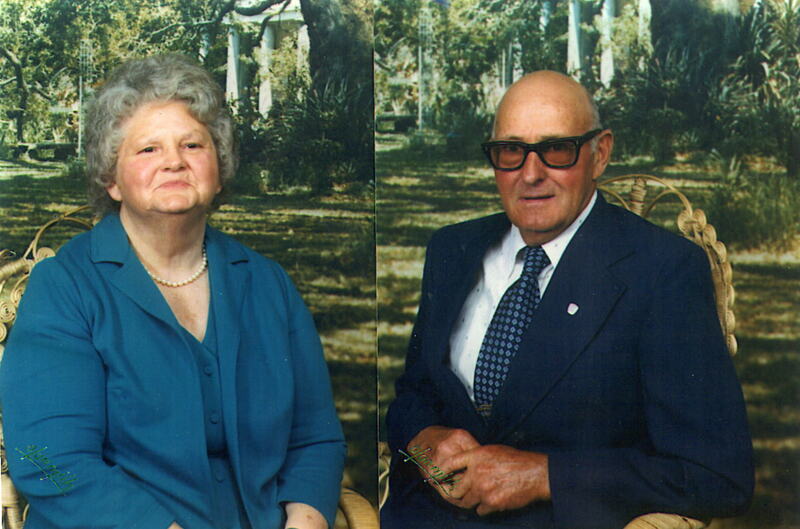 Lewis Clyde Moore, born 11-19-1911, and Margaret L. McMillin, born 2-21-1916, were married 10-1-1932. Lewis was born in Dade County, the son of Clarence Lewis and Minnie Cox Moore. Margaret was born in Sulligent, Alabama, to Jesse and Delia Millican McMillin. Lewis and Margaret were property owners and farmers. Their farm, of more than 80 acres, was next to Lewis’s parents. Lewis built a very small house that he added to over the years as his family increased. He used some timber from his property and later veneered the house with mountain stone gathered from the farm. Lewis, my dad, worked as a farmer, raising fruits and vegetables for our family. Mom canned the fruits and vegetables using a method called “cold packing”. She also made jams and jellies. Peeling and then laying them out in the sun to dry preserved fruits such as apples and peaches. These made delicious fruit pies especially after the fresh fruit was out of season. Dad planted large fields of corn and hay. He would harvest it, storing the hay in the loft of a large barn and corn in a corncrib. Some of the corn was taken to the mill and ground into meal for bread. He also planted sugarcane, which was gathered when it was “ripe” and made into molasses. Dad had a sorghum mill on his property. Ben Hampton, a famous artist from Chattanooga, Tennessee, did a painting of the mill. Before his death, he gave Dad a print of the painting. There were always cattle on the farm, including a milk cow that we milked every morning and evening. There was always an abundance of milk for drinking. Mom would let some of the milk with heavy cream clabber, then it was churned making buttermilk and butter. She would make cottage cheese by allowing the milk to clabber; draining it in cheesecloth until all the liquid “whey” was removed. I have not eaten cottage cheese so tasty since! On the farm hogs and chickens were processed for food. The laying hens would produce enough eggs to supply the family. Like all farm families, the children were taught to work the “hands-on” way. We were given chores to do both inside and outside the house and expected to perform the tasks correctly. There was discipline in our parents’ household. We obeyed our parents, and there was no such thing as rebellion or back talk. This does not mean that we did not have the opportunity to express ourselves, but in the end, our parents had the final say. We all had respect for them. Their examples, training and encouragement have made all of us better citizens. Our mother was a great lady. She always worked really hard to support our family. Apart from housework, cooking and canning, she was an excellent seamstress. She pieced quilts and quilted them. At her death, she left a quilt that she had made to each of her children. Her hobbies included crocheting, embroidering and reading..
Monday was usually laundry day. This meant that water was drawn from the well or rainwater that was collected in large barrels was used. The water was heated outdoors in a black cast iron pot. After the laundry was washed on a rub board, it was placed in the pot and boiled, returned to tubs of cold water where it was rinsed at least twice, rang out, and then hung on a clothesline to dry. Many of the articles were starched before drying, dried and sprinkled with water, rolled up for a few hours and then ironed. This process helped to get the wrinkles out of starched clothing. “Smoothing irons” that had been heated on the cook stove or by coals if there was a fire in the fireplace were used. Ironing was a real art because there was no fabric that was wrinkle free. Dad dedicated most of his time to working. In addition to farming, he worked in timber and did saw milling for Mr. A. L. Dyer. He later became a skilled carpenter and is now retired from Carpenters Local 74 in Chattanooga, Tennessee. 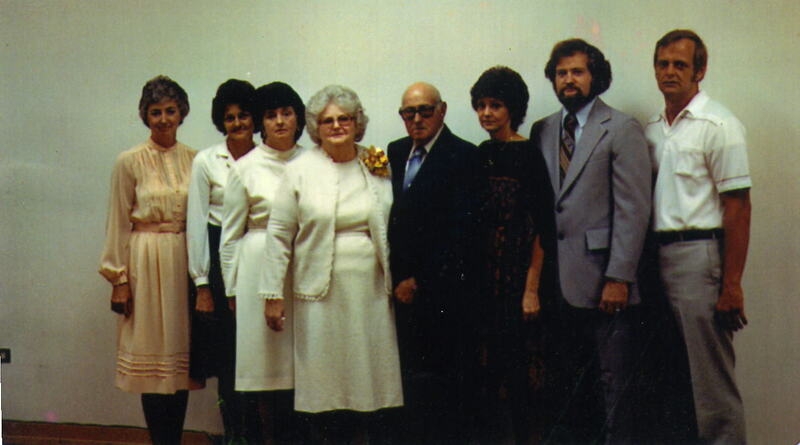 Our family attends the Cox-Moore Reunion, and it is still important to him. His ancestors started a family reunion many years ago. The descendants meet the second Sunday in July at Cloudland Canyon State Park. Mom, Margaret L. Moore, died in 1989. Dad still lives on the old homeplace. At almost 85, he still makes a large garden, cans and freezes fruits and vegetables, and tends to his cattle. He raises cattle for his family’s use and raises some to sell. He is still responsible for raising and storing hay. Dad does his own cooking, laundry, and light housekeeping. He enjoys all sports, reading and visiting his family and friends. He can still drive. 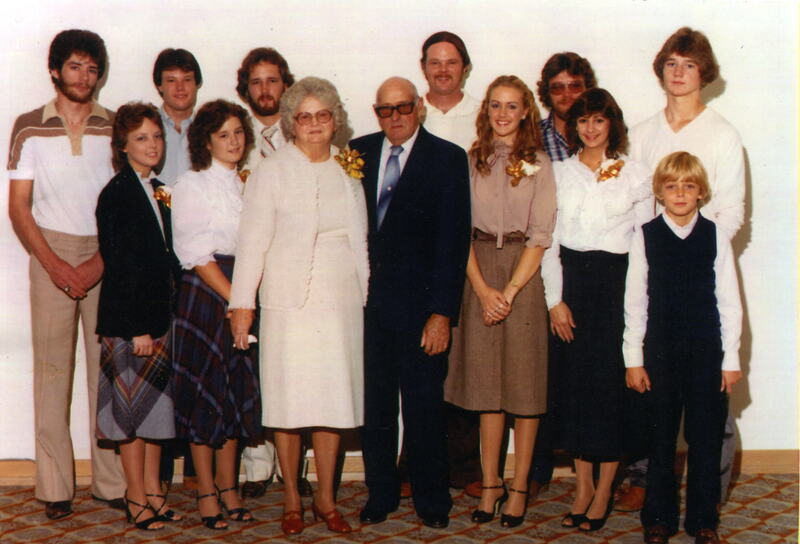 Mom and Dad attended the Worldwide Church of God. They were parents of seven children. All their children grew up in Dade County in the New Salem Community. They attended school at New Salem and Dade County High in Trenton, Georgia. Each has been successful. All are Christians and have contributed much to the community in which they live.